Frozen characters merge with The Princesses in this gift basket! 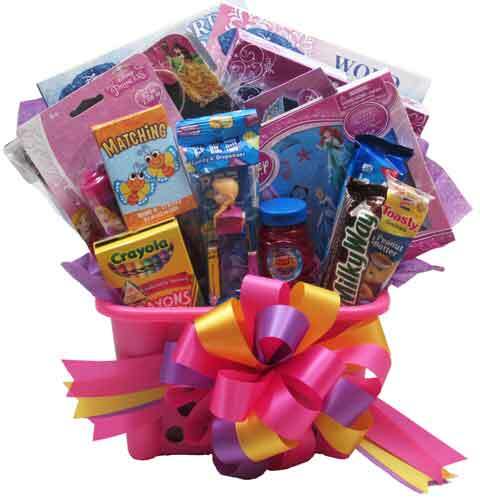 Great for birthdays, get wells, back to school, end of school celebration, just because, etc. Filled with Frozen and/or Princesses themed: two (2) Coloring/Activity Books, Chalkboard, Boxed Puzzle, Sticker/Activity Set, Jump Rope, and Pez Dispenser with Candies. Also included: Crayola Crayons, Playing Cards, Bubbles to blow, Cookies, package of Snack Crackers, Chocolate Bar, and a Rhinestone Wand. The plastic container can be used for future uses, like keeping everything organized! We wrap it all up in crisp clear cellophane and top it off with a big beautiful bow in bright pastel colors. For shipping, we shrink-wrap and use a different smaller bow. Note: We can design this in an Easter basket for an Easter gift. Just let us know in Special Instructions at check out.